This page contains a variety of civil engineering teaching resources. It is made available in the hopes that others can use and improve upon them. All material contained on this page is licensed under a Creative Commons Attribution-ShareAlike 4.0 International license. The materials are only provided for educational use and may contain errors and omissions. The materials shall not be used for engineering design, development, testing, and/or analysis or in any application that involves life or public safety. Both AASHTO M145 and Casagrande plasticity charts are available in this package. The charts were created in OriginPro and the source file is included along with PDF and JPEG versions. If you find any mistakes, please let me know so I can update and correct the charts. Email me! 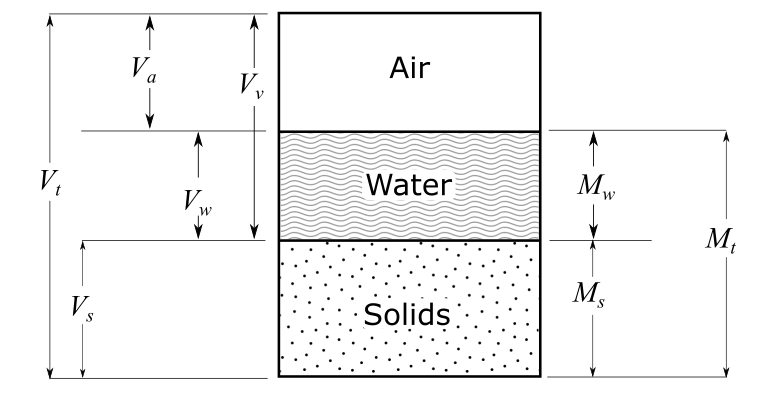 A template for the soil, water, air phase diagram or volumetric schematic (or whatever you would like to call it) is available in a vector format. It was originally created with Inkscape which is a great and freely available software package for vector file creation and editing. ​If you find any mistakes, please let me know so I can update and correct the charts. Email me!